Read the rest of the poem here or listen to Richard Wilbur read his poem. Be sure to visit Jama at Jama’s Alphabet Soup for the round up of Poetry Friday posts. I didn’t know this poem – so glad I do now. (Really enjoyed the video.) Time to go move among “the world’s hunks and colors” – thanks for sharing! For some reason, I knew the title of this poem, but hadn’t really heard all of it. Wonderful video (beautiful reading voice!). Love the image of angels in the opening lines. What a fine wordsmith Mr. Wilbur is. What a charming video! Would love to listen to that again. Thanks. Ah – the smell of line dried laundry! Thanks for sharing this lovely poem and video. “Awash with angels.” I love it! And I laughed out loud at “Let there be nothing on earth but laundry.” Wonderful! Thanks so much for sharing this poem. When I was living in Australia, clothes dryers were (and probably still are) less popular. 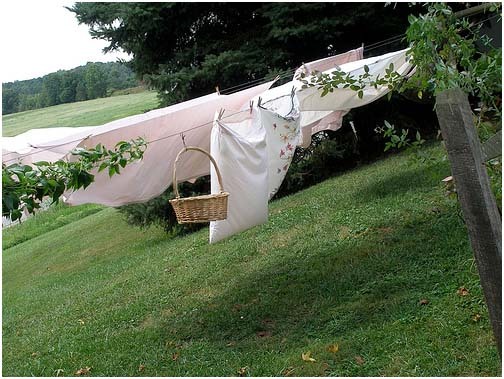 I quickly learned to love the meditative experience that hanging laundry came to be… except when the birds used my towels for target practice. Thank you for posting this wonderful poem and video.